A 26-year-old Irish man has been sentenced to two-and-a-half years in prison for providing funding for the so-called Islamic State. Hasan Bal, formerly living at an address at O'Connell Street in Waterford, was sentenced at Waterford Circuit Court. He had pleaded guilty to two separate terrorist-related offences when he was arraigned on the charges at a previous sitting before Judge Eugene O'Kelly. Bal first pleaded guilty to unlawfully transferring €400 by means of an An Post/Western Union to Stevo Maksimovic in the city of Brako in Bosnia Herzegovina on 2 October 2015. The court heard he did this intending or knowing that the money would be used in whole or in part for the benefit of the terrorist group, also known as Daesh. Bal also pleaded guilty to a second charge that on 23 October 2015 he communicated by phone with an intermediary in London in an attempt to collect or receive cash for Islamic State. The court heard today that the case came about after an undercover reporter with the Daily Mail based in London - Omar Wahid - made contact through an online messaging service Keek with Omar Hussain (also known as 'the Supermarket Jihadi). The journalist pretended to want to organise funding for IS. The court heard evidence from Superintendent Anthony Pettit that through another IS member based in Syria, Abu Issa Amriki, contact was made between the journalist and a person the court was told was a "brother who was a fundraiser in the UK". This was Hasan Bal, who was operating out of Waterford and using a false online name. A 'sting' operation followed where money was due to be handed over in an envelope in London, but the journalist contacted police to expose the fundraisers after he had put a street guide into the envelope instead of money. The court heard that Bal had made an attempt in April 2015 to travel to Syria to be part of IS there but was turned back at Istanbul airport in Turkey. He had also organised a fake ID for himself in the form of a press card under the name David Fahy - his mother's maiden name was Fahy. An image was found on Bal's phone of him dressed in combat gear with an imitation pistol; and propaganda videos were also found. Supt Pettit said that the people Bal had been in contact with were medium to high level members of IS. Bal was born in Britain to a Turkish father and a mother of Irish descent. He came to Ireland in 2005 and his parents separated. 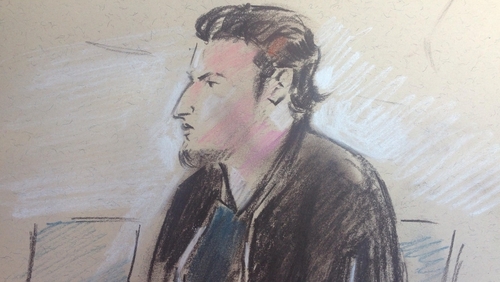 The court heard how he became radicalised out of guilt that he was not living a strict Muslim life and his anger at what was happening in Syria. His defence said Bal was extremely sorry for what he had done; that he was very remorseful; that he regretted what he had done; that he has now been deradicalised and was asking the judge for mercy. The court heard that there is no Jihadi group in Waterford and the Muslim community in the city had no idea what was going on. The maximum sentence he could have faced was 20 years. Judge O'Kelly said Bal had secured the confidence of significant members of IS but he said there were a number of mitigating factors, including his guilty plea, lack of prior convictions and his commitment to changing his ways. Judge O'Kelly gave Bal, a father-of-one, a four-and-a-half year sentence but suspended the final two years and the sentence was backdated to April 2017 when he was first taken into custody. In sentencing, Judge O'Kelly said that people are well aware of the escalation of acts of terror around the world and that a few hundred euro in the hands of a ruthless and dedicated terrorist could be used to deadly effect. He said he was taking into account aggravating and mitigating factors in relation to the sentence. In his comments, he also said the overwhelming majority of Muslims in Ireland do not support such radical ideologies as IS and stressed that the rise of Islamophobia should have no place in society. Judge O'Kelly gave Bal, who holds an Irish passport, credit for his early plea, his efforts to reform, his remorse and his previous good character. The judge also made it a condition of suspending part of the sentence that Bal engage in deradicalisation counselling by experts in the field. At the time of Bal's detention last year, he was training to work as an electrician. His wife gave birth to their first child, a baby girl, while he was in custody. His wife was also born in England. Waterford Circuit Court heard that this was the first time anyone in this country has been tried and jailed under this type of anti-terrorism funding legislation.